The U14 girls team celebrated their victory alongside supporters after their 4-0 win against a depleted DJ Gas Sister Girls. Meanwhile the Tupapa boys’ team also beat their opponents DJ Birds 3-0 in a tough tussle. Both teams have had a great run this season, with the U14 girls team coming away with seven wins and one draw out of eight matches, while the Tupapa boys won six and drew two matches in total. In the Under 11 Mixed division, Katukangas came out victorious in their final match against Jnr Pirananhzz with a 3-1 score to earn top honours in this division respectively. Titikaveka also had a good run defeating TKV 11-2 at the full time whistle, while Wild Wild West beat team Hoteyes 4 goals to nil. The season has been an exciting for teams in this division, with players improving and growing in the game of football. In the Under 8 Mixed division, it was Titikaveka who earned their top spot on the points table, after edging ahead of a determined TKV team with a one-point lead to win their final match 3-2. Their victory was celebrated by the many supporters and parents who gathered alongside the pitch to cheer them on. In other matches, Tupapa Renegades beat Wild Wild West 3-0, while Baby Katukangas also went home with a win after defeating their sister-team Baby Hoteyes 4-0. Competitions manager, Pauline Dean said this year’s junior five-a-side season drew in a lot of interest from both parents and their children alike. “It was very pleasing to see the huge support coming from everyone and it made this year’s competition a fantastic and enjoyable one for all,” she says. The successful Junior Five-a-side Competition drew to a close on Wednesday afternoon at the CIFA Complex in Matavera. The final matches of the junior five-a-side competition certainly highlighted the essence of fair play and true sportsmanship as teams displayed outstanding performances throughout the season and ending on a high note. 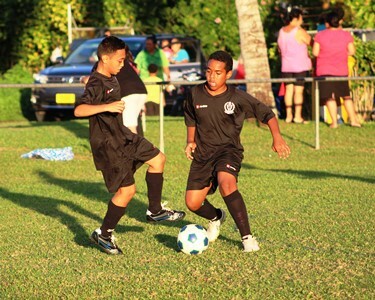 The Cook Islands Football Association would like to extend their deepest appreciation to all the teams, players, coaches, parents and supporters who joined in this year’s competition and making it a successful one.